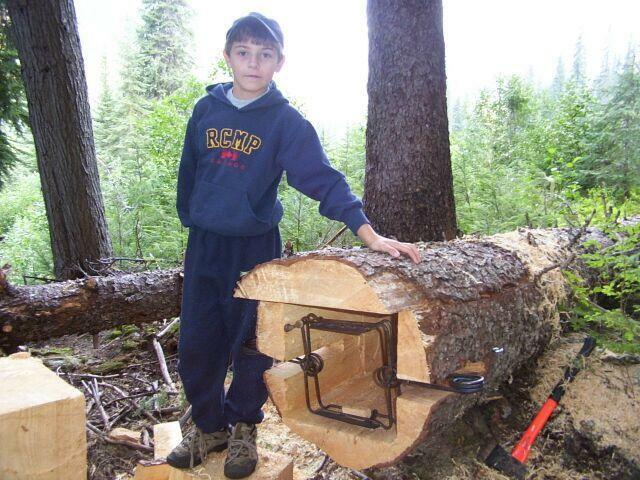 I took in a seminar on the weekend by a BC trapper on wolverine trapping. Carl (you know him Trapper Ron) traps in an area with a good population and harvests them consistently year after year. His beliefs are that snares and footholds have too big a failure rate and chances of loss. He also believes most wolverines have been smacked by a 120 marten set by the time they encounter their first wolverine set. He also believe the average set just kills the dumb or desperate wolverines. this has led to the legend of the uncatchable wolverine. Carl advocates using a log set for all wolverines. Pretty sure we've all seen these. Cut top slab off 4-5' log section. cut out inside to fit 330 bodygrip and accomodate bait cavity. After trap is placed the top slab is nailed back in place. the trap is set at least 2 feet inside the entrance so that the wolverine has to crawl in and receives a good smack. The trap was modified to have a foot pan and also a striker bar was welded to top jaw. Typically a whole beaver is placed in bait cavity a couple of feet past the trap. His trap cable is on swivels and secured tightly to the trunk. Any thoughts on this set? Sounds like a lot of work to catch a critter. Would like to see some photos for discription. The big question for me would be problems with marten. Probably trap local marten first. Have others sets for them nearby. Can you set the pan trigger to not snap with a martens weight. I have decided it is best to find interception points that are void of marten. Sounds like a timesaver on a registered line to have those sets where wolverine frequent year after year. Just throw the bait in set and go just like trapping marten. You need a big tree though. I seen that set in the NAFA mag years ago-probably same guy. Last edited by Boco; 07/25/13 02:59 PM. I think many wolverines may have been smacked by a 120 if they are in an area where people are making sets on the ground. Small diameter pole sets discourage most wolverines from investigating marten sets too closely. I also think that the more different traplines a wolverine encounters, the better his chances for being educated. Most people are too lazy to approach it correctly, IMO. I would disagree about snares and footholds having a high failure rate if a guy uses the proper hardware and thinks about what he's doing. I can honestly say that the last wolverine I lost from a foothold was in 1993. It was from a #3 victor in a cat set. It was plenty of trap for a cat, but not gulo, and my mistake was not anticipating his arrival. The last snared gulo I lost was about 1998. It was from one of my snare poles and he got his back feet on the ground and twisted until the cable broke. I should have realized the set was too low. Now I know. I do agree with him that a myth has grown up around these animals. But it isn't because they are smart or cunning or magical. It's because we are lazy and don't think through all the possibilities. Theres NOOOO way that could be you in that picture White17, they didn't have traps invented like that when you were that age!!! Good reading, sure makes a low lander want to move up north!!! That's me three years ago. I just look young due to clean living. Its just comes with the proper tools and the proper knowledge of how to use them. I use buckets, can leave out just like the log. I also like to throw in a few snares and foot holds here and there as well. I think most don't "know" what they are doing and hang a snare anywhere...or put a foothold and figure "that should work." I'm sure there are some educated wolverine out there, but I think that their gut (staring at a chunk of beaver) will override their brain eventually. "Goats pee in the water sheep drink." IMO the hollow log set is just a cubby the wolverine cannot tear apart to get the bait. Yes it works but is a lot of effort to construct. Better yet IMO is a 2-3 ft double end 330 conibear(culvert) cubby with the bait in the center. It's my experience that if the critter can see its way out the other end they seldom hesitate to enter the set. Yes it requires two traps but is worth it IMO to catch a $300+ value critter. The only constant in trapping is change so keep learning. I agree with W17 on the foothold & snare issue and Len brought up a good point about problems with marten. I know what thats like. I think the guy is right in that most wolverines are likely to have been smacked by 120s.....that why I prefer snares. I miss few and have only lost one. But there is no question the set would work, its just in my area at least marten would be a big problem. I agree W17. One part of trapping that goes by/over most trappers is that when Gulo comes by your set everything has to play out just right. It is just as easy to over think the set as it is to be lazy in the details, both can lead to a refusal or a miss. But, their lust for wandering is a double edged sword. They are seasoned to sets, but are perpetually hungry. For what I do a natural brushed in cubby with heavy rocks and logs funneling towards stepping sticks with a foothold is the way for me and my location. My footholds have a decent amount of pan tension and rarely do I catch marten in these sets. Baited buckets have not worked, yet. I have made catches in BG's in natural cubbies. When setting these I shape the trigger wires to minimize catching marten. I do know a few trappers that use that set, Carl being one of them. Does not take a really big log if you use a 280. With the right cuts you can make this set with a 6 foot log in about 30 minutes or less and the set is there for a long time. The bottom cut can be made just like the top cut only you do not cut the slab off. The pan modification and the trap far into the set is an added touch for sure. This can be made as a double ender also. Most of the wolverine taken in BC are in boxes with a 330 or 280. The trap needs to be secured in the box or cubby so the wolverine can not pull it out. Wish I was in wolverine country again. White the set is identical except the trap is in deeper. Carl also uses only one scent for wolverine which is unique to those sets. Right now a Forsyth wolverine lure. The idea is the scent is different then all the other marten fisher set lures and acts as an attractant. Well there is sure no doubt in my mind that they have amazing noses and excellent memories. I have caught a few with missing toes. They probably lost them in BC or the Yukon to have made it here. I think their hunger is almost always their demise. I have yet to do the rodeo with a super smart one, so I am thankful for every dumb one I catch. They don't come easy and every one of them I bring home is truly special. The most sucessful wolverine snare guy I'm friendly with, builds his snares with multiple swivels in them.